Most of the financial articles written today discuss how stocks are historically cheap and then go on to provide a long list of reasons why we are in the first inning of a new bull market. Most of these experts work for firms that profit in the form of commission fees when customers purchase stocks through their company or invest in their mutual funds. Similar articles were written by Realtors back in 2006 regarding the "new era" of home prices rising. We'll begin first with a simple conversation on valuation. These experts say that stocks are cheap because their P/E ratios are at the historically low ends of their range. They say that using "projected future estimates" on earnings growth that the current P/E ratio for stocks is somewhere between 11 - 13. These analysts take the current rise in earnings and draw a dotted line on a chart extrapolating that line directly upward at its current rate. This provides the P/E ratio today for the earnings projected in the future. 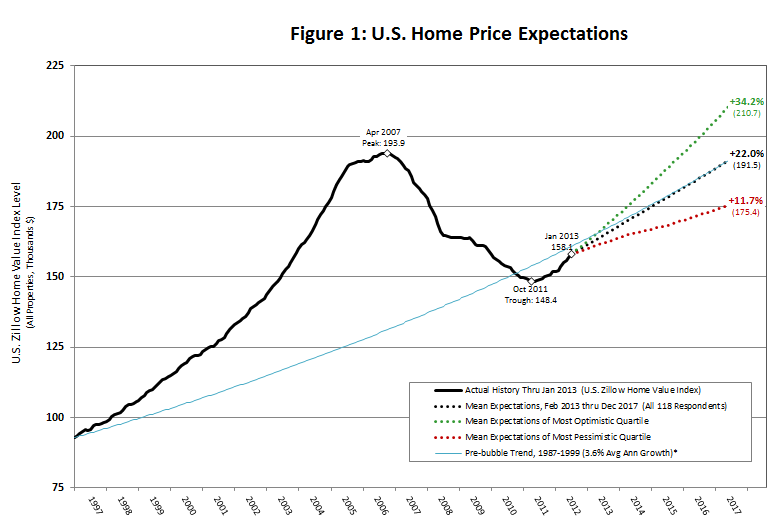 Let's use a chart of home prices to help explain how this works. The following shows Zillow's home price index rising and topping at the 2007 peak, the subsequent collapse, and then the start of the most recent rise. The chart has three projections: best case, most likely case, and worst case. All three expectations use a line that extrapolates upward moving forward based on the most recent 12 month period. Your realtor sits down with you at your kitchen table and shows you these scenarios. 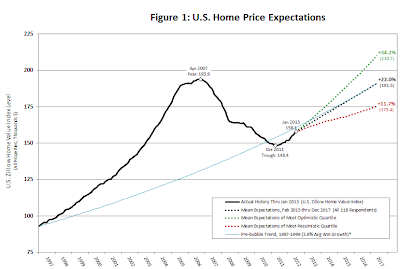 The worst case scenario you are told is that your home only rises 11.7% by 2017. She is an expert and she has a chart, so you happily put down your deposit and move in. Does this seem ridiculous? Of course it does, but this is exactly what happens every day when you call your financial advisor and he tells you stocks are cheap. Maybe he even takes the time to send you a chart of projected earnings rising upward forever. Robert Shiller uses a P/E ratio that uses the trailing 12 months on earnings against stock prices today. It has no bias on where earnings may go in the future. Using that ratio the P/E is currently over 23, in the range where it has historically topped in previous bull markets. 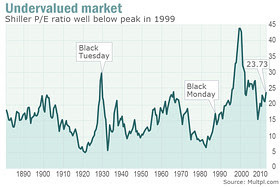 The following chart shows this Shiller P/E ratio and notes that it is "well below 1999 peak" as if to describe the current ratio as cheap. It fails to note that is we are also at the range where markets topped in the early 1900's, 1937, and 1966. Only the late 1920's mania and the period we entered after Greenspan's famous 1996 "Irrational Exuberance" speech have seen higher P/E ratios. Others will dismiss earnings and say that it is profits that count, and they are correct that companies have seen their profits surge during the post financial crisis recovery. Let's quickly review this important piece of the discussion. The following chart shows the recent record breaking rise in corporate profits since 2009 (blue line). 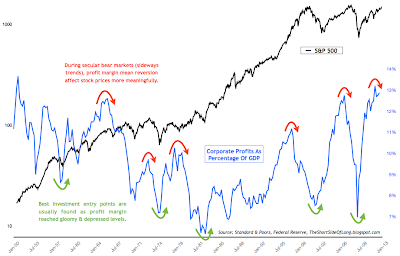 What the chart also shows and what many financial experts fail to mention is that corporate profits over time go through a mean reversion process. Coming out of a recession corporations slash costs significantly. The combination of lowering costs and rising prices causes the margins to rise. Over time they face trouble finding additional costs to cut as they may have already let go or cut the hours of every employee possible. Then they run into the normal business cycle down turn every 4 to 5 years where sales begin to slow their acceleration (this is happening right now). This process has repeated throughout history and it will occur again. It is like the tides of the ocean. Most analysts today say that "this time is different" and in the new economy profit margins will continue higher forever. Before I end the discussion it is important to briefly look at the other side of the equation when making an investment decision: Sentiment. Why does sentiment matter? Because in the real world P/E ratios and profit margins do not decide when stock markets are going to top. Markets top when investors decide to buy less stocks than what is being sold, and not a moment sooner. In other words, a market can stay irrational for far longer than rational market observers would imagine. Sentiment in the stock market today is beyond euphoric, and I have covered most of these sentiment indicators over the past few weeks as they have crossed over all time record bullish levels. Not post 2009 record bullish levels: all time historical record bullish levels. Greater than the both the 2000 and 2007 top. Look at the chart from that article showing the "experts" predictions of earnings. 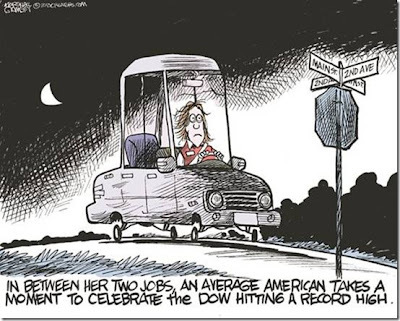 They showed earnings plunging lower from that point in March of 2009. Contrast that to where we are today as earnings estimates show earnings surging higher from here. Today, the far edge of that time frame is clearly in reach. From its low of 6,547 on March 9, 2009, the Dow has risen 117 percent. Another 117 percent in four years would put it at 31,022, just 16 percentage points shy of the magic number. A market peaks when investors stop contributing new money to the asset, not when it becomes overvalued. I will not tell you that I am smart enough to know when that day will be or how overvalued the U.S. stock market will become before finally topping out. I can only show you that we have already crossed the point of danger based on historical valuations and sentiment levels.